Keep your sweetheart close to your heart each time you wear this beautiful photo necklace. Choose a favorite photo of the two of you and have us create a necklace that will make a treasured keepsake and valued accessory. 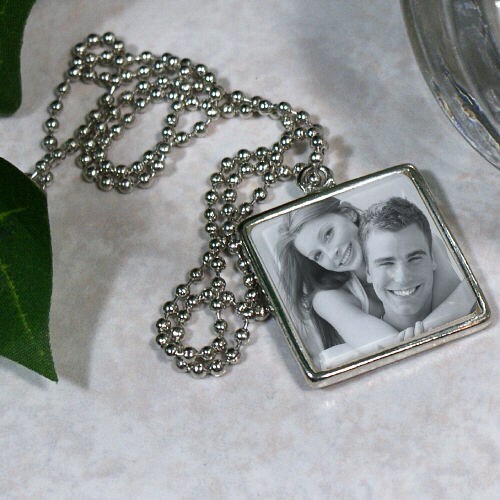 The Pendent is a silver-plated square frame that features a 1” Crystal insert that can be printed with your photo. The Photo Pendent hangs from a silver-plated Ball Chain Necklace, measuring 23” long. Photo gifts include free personalization of any digital photo. Just simply upload your favorite photo. For production purposes, please enter a description that best describes the photo you are uploading. Additional Details Personalized Jewelry from 800Bear.com makes a lovely addition to your romantic plush animal.